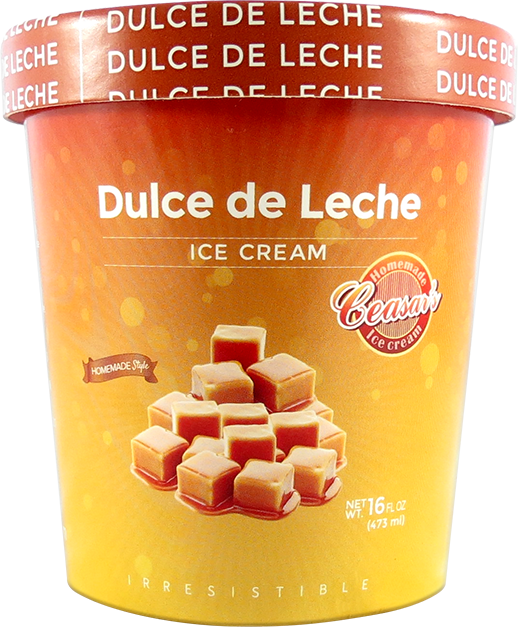 With our Dulce de leche ice cream you can automatically taste that homemade, sweet and creamy texture all on one spoon. Dulce de Leche base, milkfat, nonfat milk, sugar, corn syrup, buttermilk, whey, mono & diglycerides, guar gum, cellulose gum, disodium phosphate, calcium sulfate, polysorbate 80, locust bean gum, carrageenan, gelatin, natural color, vitamin A, palmitate. When you think of Dulce de leche, somehow you can automatically taste that homemade, sweet and creamy texture all on one spoon. It is almost impossible to eat it and not be surprised by the rich, caramelized delicacy that our Dulce de Leche ice cream seamlessly blends together. Its consistency is capable of filling you with happiness just with one single taste. No matter where you’re from, each culture welcomes dulce de leche in different ways. That’s why we wanted to recreate that homemade taste and texture and incorporate it into our decadent Dulce de Leche ice cream to help bring back those memories you cherish the most.